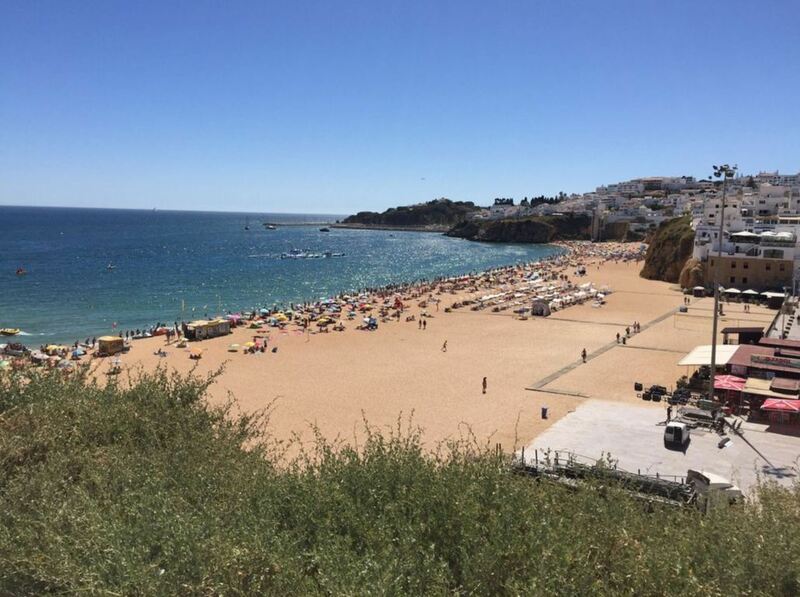 Praia dos Pescadores is a city beach in front of the old town of Albufeira. 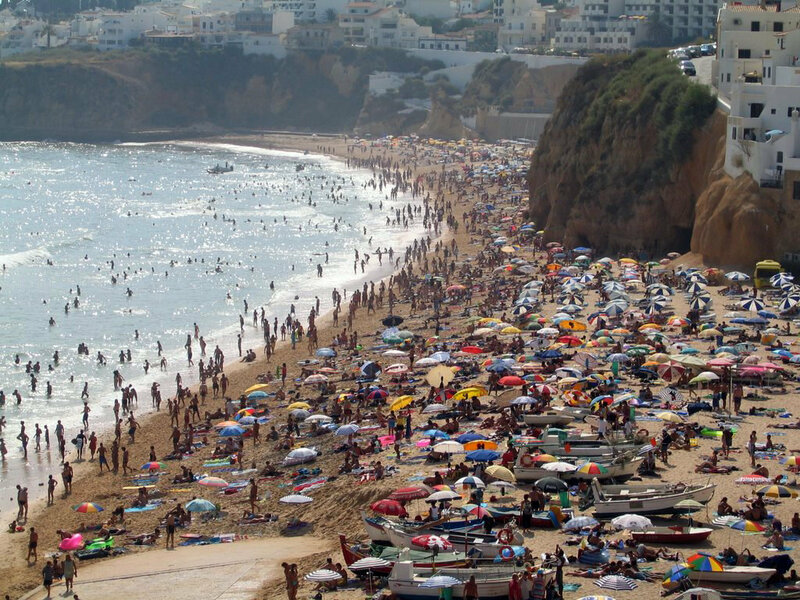 Due to its location, it is one of the most visited beaches in Albufeira. 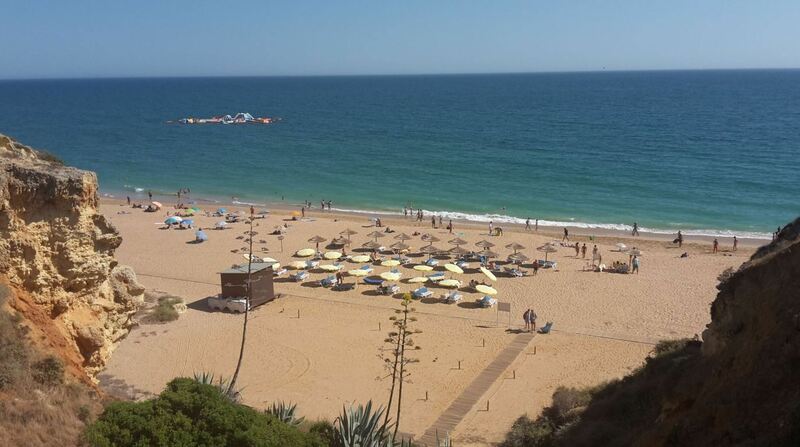 Are you looking forward to visit Albufeira? The short video below shows you what you can expect from Praia dos Pescadores. Praia dos Pescadores forms actually one big beach, together with Praia do Túnel. 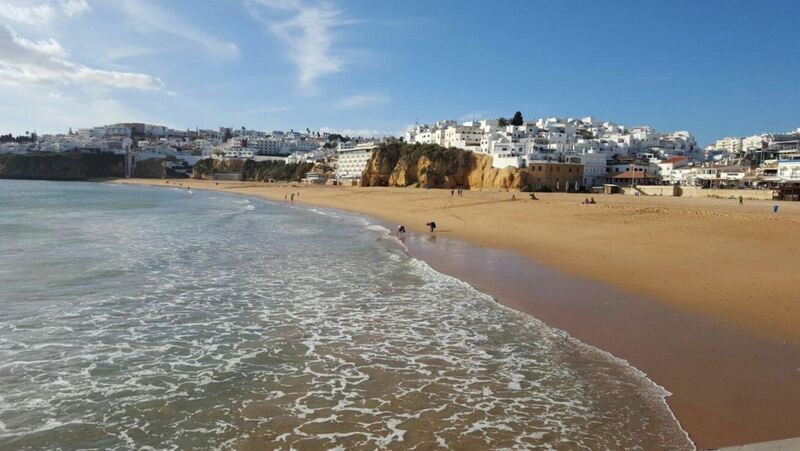 These beaches are the closest to the old town of Albufeira. The protruding cliff in the middle of the beach separates Praia dos Pescadores from Praia do Túnel, with Praia dos Pescadores in the east (on the left side) and Praia do Túnel in the west (on the right side). On the east, Praia dos Pescadores is bordered by Praia do Inatel. Praia dos Pescadores is about 225 metres in length. During low tide, it is more than 100 metres wide. The sand on the beach is fine and gold-coloured. It is soft on some parts, and harder on some other parts. You will encounter many shells on this beach. Some of these shells are broken, which can hurt your feet. It is a good idea to walk with shoes or flip flops on the beach. There are wooden walking trails on parts of the beach, which makes it easier to walk across the beach. It can be quite painful to walk barefoot on the scorching hot sand. The water is clear and clean. The temperature of the water can be a bit cold, but it gets warmer in the summer. The waves on this beach can be strong at times though, so be careful with children in the water. All the beaches of Albufeira have rock formations protecting the beaches. You will find signs advising you not to stay close to the rocks. Due to potential rockfall, it can be dangerous to sit just below the rocks. It is possible to experience the beauty of this beach from the comfort of your couch, by viewing a 360 degree picture of this beach. As Praia dos Pescadores is a city beach, some parts are usually very crowded. Especially in the summer, the beach of full of people. If you prefer privacy on the beach, it is best to go to another beach. A variety of water sports are available on this beach, including jet ski and parasailing. 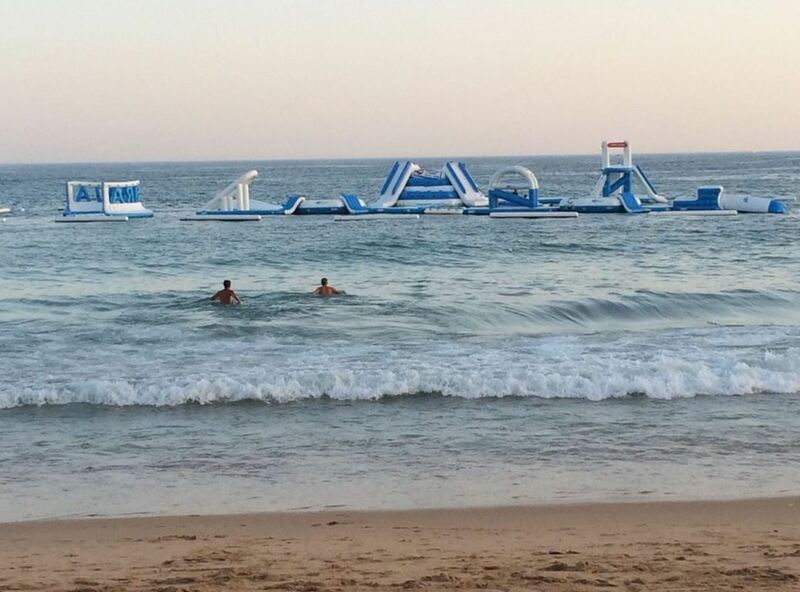 In the summer, there is also an inflatable water park. Kids love to play here. On the cliffs on the eastern side, there is a nice viewpoint, called Pau da Bandeira. 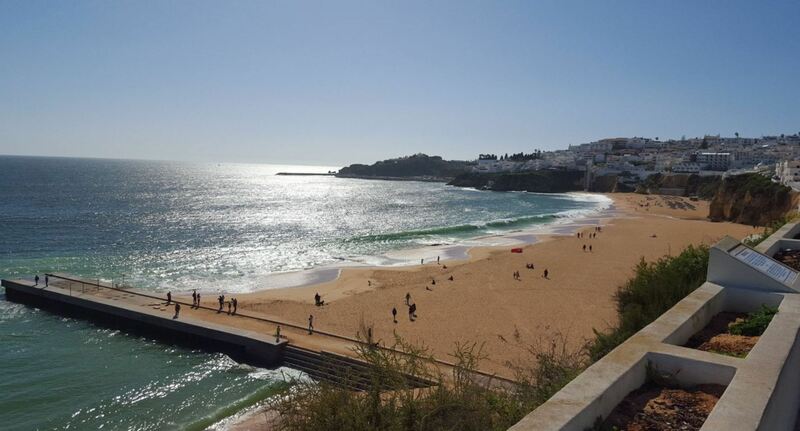 The viewpoint has magnificent views over the old city and Praia dos Pescadores. From the viewpoint of Pau da Bandeira, you can descend via a modern escalator. 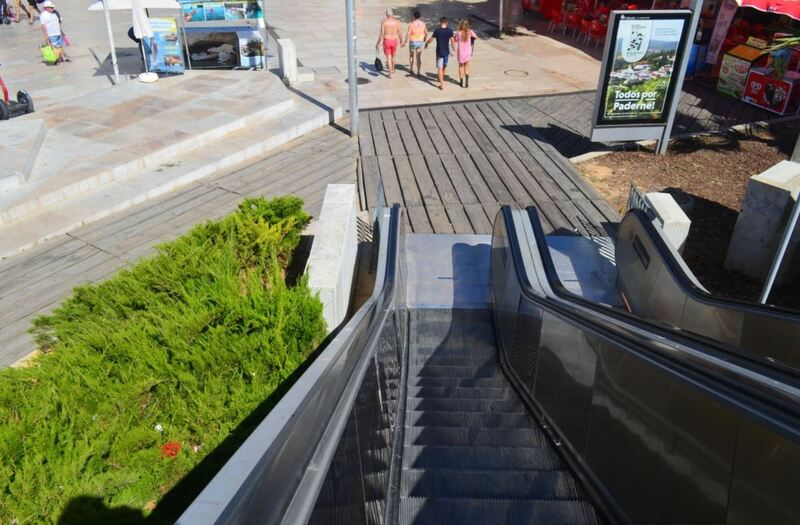 The escalator takes you directly from the cliffs above to the beach. It is interesting to see an escalator outside, because usually they can only be found inside a building. The big square behind the beach is home to many open air concerts and other types of entertainment. The square is surrounded by many bars and restaurants. There is also a boulevard. It is a very lively area, especially in the evening. 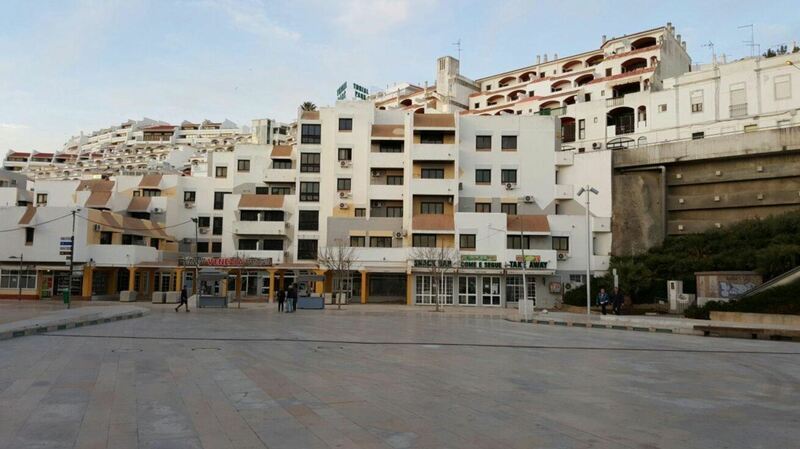 From the beach, you can easily walk to the square and then to the centre of Albufeira. You can skate, cycle or hoverboard here. It is also possible to rent a Segway, so you will see some of them driving around. 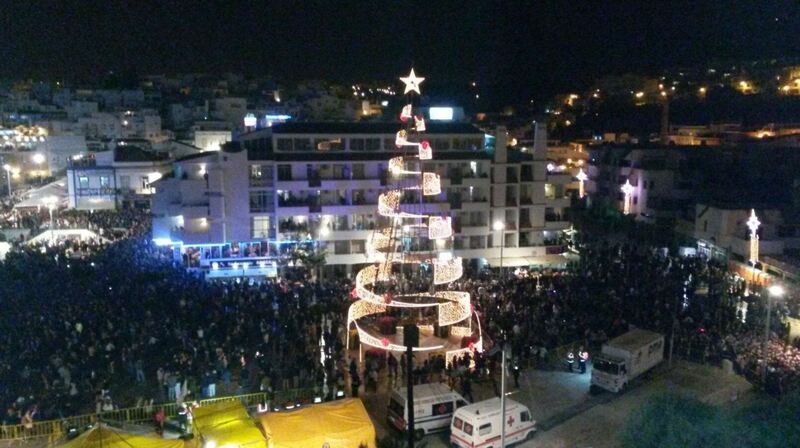 Every New Years Eve, this square is home to a big show. Thousands of people come here to enjoy the entertainment and celebrate New Years Eve. 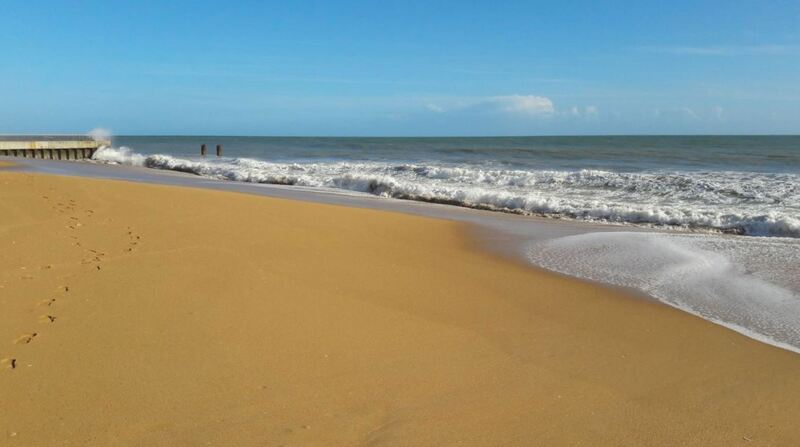 Literally, Praia dos Pescadores is translated as fishermen’s beach. Back in the days, the fishing activities were related to this beach. You could see many fishing boats here. In ancient times, the fishing boats were pulled from the water to the sand by oxes and in the 20th century by a tractor. You could see fishermen repairing nets on the beach. Or you could see them bringing baskets full of fish to the fishing auction, which was situated close to the beach. Such activities do not exist anymore on this beach, since the new marina was built west of the town. The fishing boats have all moved to the marina of Albufeira. 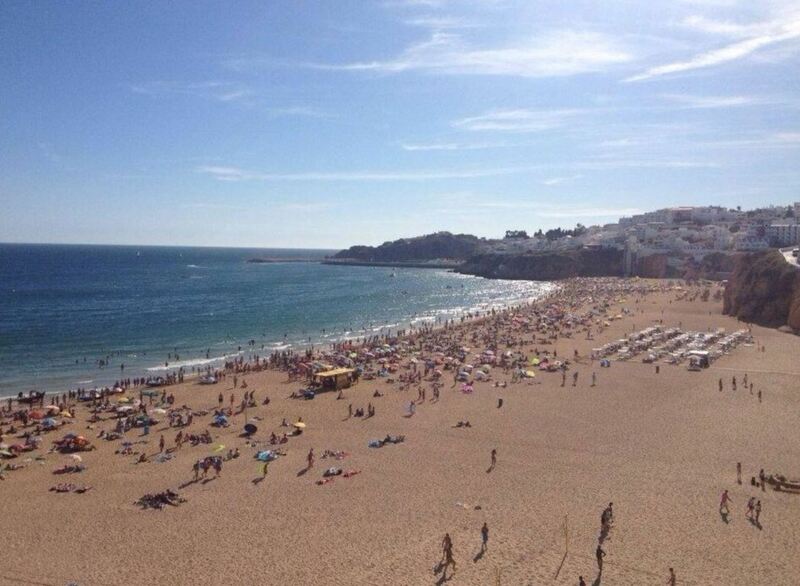 Nowdays, you will only see tourists and sun worshippers on Praia dos Pescadores. 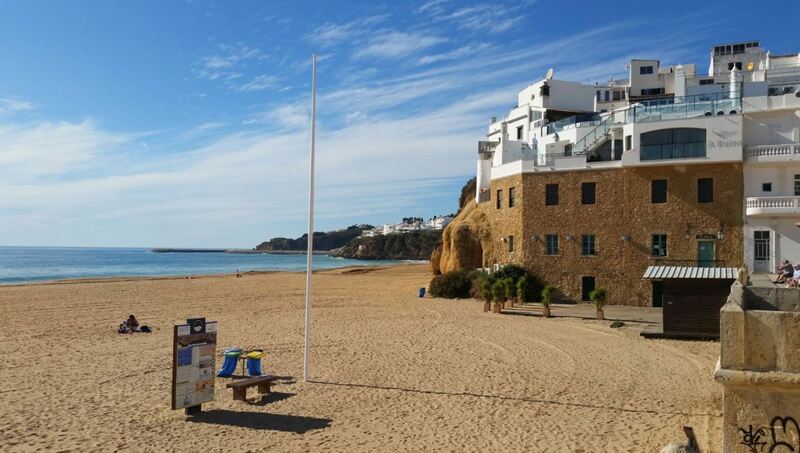 As the fishing activities are no longer on the beach, many locals tend to call this beach simply Praia de Albufeira. Cabana Fresca. This Portuguese restaurant offers fresh fish and seafood. The food is great and the staff is friendly. Ricardo’s Pizzeria. This is one of the best pizzerias in the old town of Albufeira. 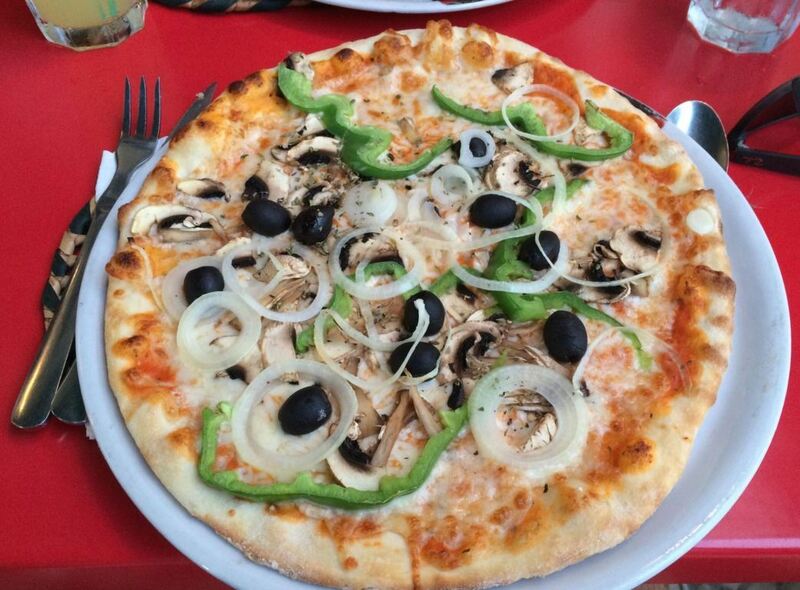 They have fabulous pizzas and a great rooftop terrace with sea view. Spice Lounge. This is one of the best Indian restaurants in town. Very tasty food and excellent service. If you like spicy food, this is the place to be. Inn the Beach Apartments. This three bedroom apartment is perfect for families. Highly rated. Old Town Apartment. This is a clean apartment with excellent value for money. Only a couple of minutes walking from the beach. Sea View Apartment Old Town Center. This modern apartment has two balconies and provides great views over the sea. 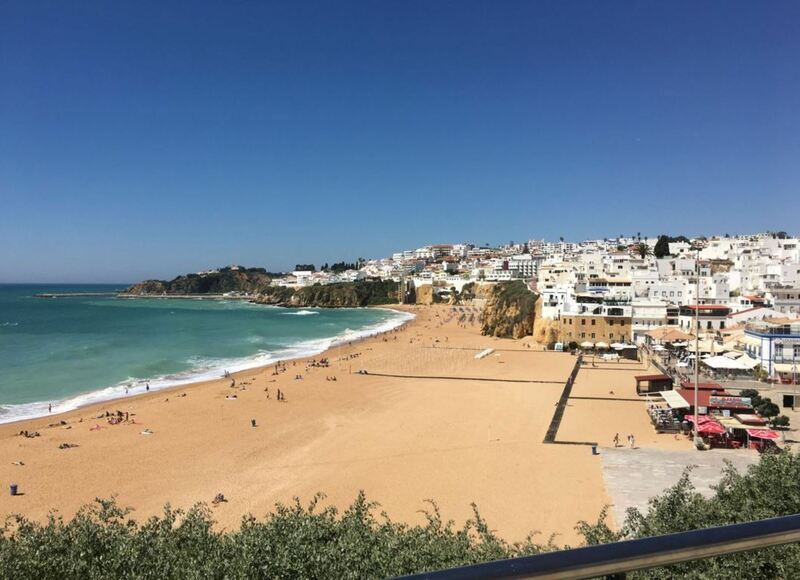 Depending on where you are in Albufeira, you can access this beach by escalator from the upper city, through a man-made tunnel from the old town (and then turn left) or just walking from downtown Albufeira. 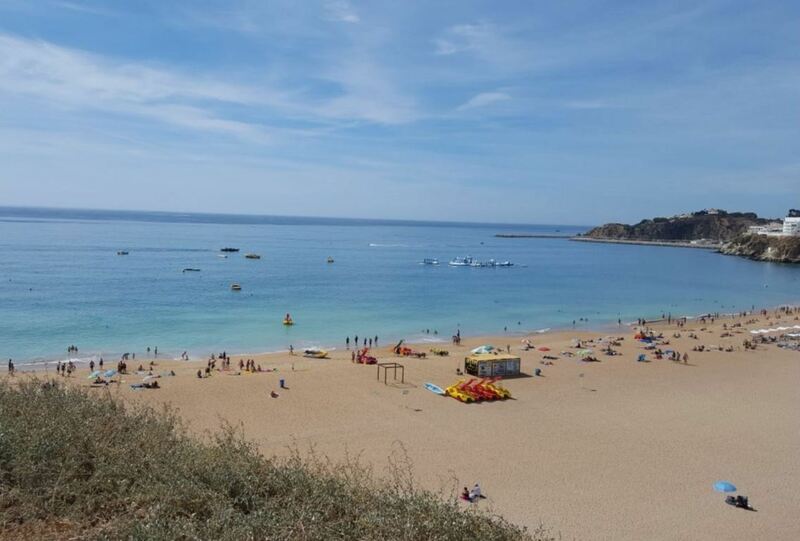 To get to Praia dos Pescadores, you can enter in your GPS the following address: Rua Bairro dos Pescadores Albufeira. 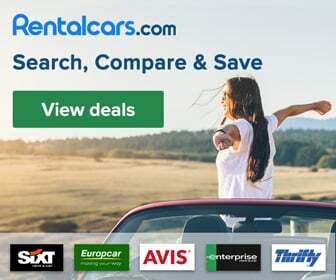 You can park your car in a car park near Avenida 25 de Abril within the old town, or in the car park on top of the cliffs, near the escalator. 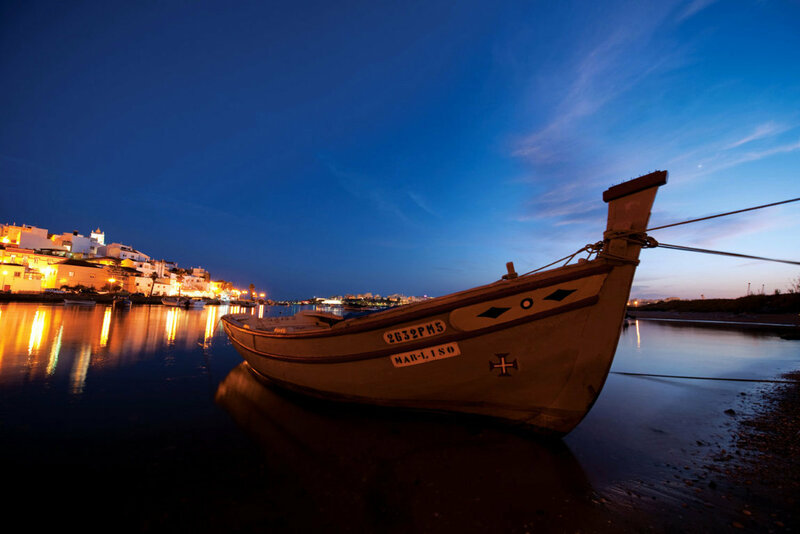 Albufeira is perfectly located to explore other parts of the Algarve from. There are so many other things to see in the region. You can also book excursions to experience the Algarve in another way. For example, seeing the coastline by boat and exploring the many caves. You can book some of these excursions already online. Below you can see our favourite excursions in the region. As Praia dos Pescadores is a city beach, you will find everything you will ever need around here. The beach is also accessible by wheelchair.